We explore the rivers and estuaries of the East Coast of Essex, Suffolk and Kent, and also go to sea, weather permitting! Click here to see a map of our cruising area. Cruises last 5 days from the Monday to Friday and normally explore the East Coast of Essex and Suffolk by going to sea and anchoring overnight in one of the many rivers and estuaries available. The new crew boards Thalatta – often at Ipswich Haven Marina or The Hythe, Maldon, and are straight away given an introductory talk explaining the ‘rules of the ship’ and safety instructions. From that point on ship routine entails sailing the vessel, using the dinghies, learning about wildlife, food preparation in the galley, writing up the log and many other activities. Find out more about our cruises for schools, and read testimonials from some of the schools who have taken trips with us over the years. Day Sails are run when school or other parties are not using the barge for cruises. As implied, a group of up to 12 people are taken for a trip starting and ending at the same location, such as Ipswich Haven Marina. This group is fully catered for with refreshments morning and afternoon, together with a full lunch with wine. Those wishing to do so are encouraged to take the helm. 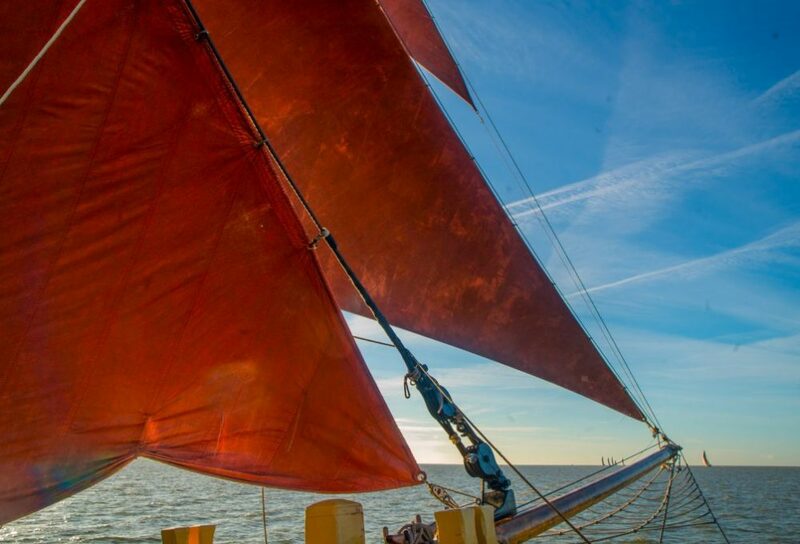 Find out more about our Day Sails.